HTC guys are preparing to release the Android 4.4 KitKat update for all the HTC One users of T-Mobile US. The same update is already out for the Sprtint and Verizon users for a while now. The newest firmware comes with the Sense 5.5 user interface, which brings the customizable Blinkfeed homescreen pane. The latest version of Android also comes with several tweaks and improvements to enhance the overall performance. 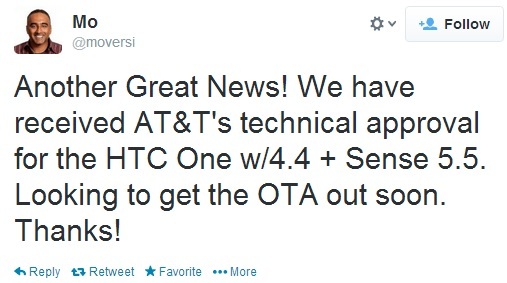 Meanwhile, the update isn't far from reaching the AT&T HTC One consumers, according to HTC's executive director of product management Mo Versi. The Taiwan manufacturer seems to have received the carrier's technical approval for the update and the new firmware will start rolling out very soon.